Playfully and at times painfully self-aware, Rick Moody flees from conventional storytelling as if from the West Nile virus or Enron stock. His relentlessly clever stories and novels have always taken the path of greatest resistance. Overripe highbrow prose is studded with slangy pop-culture references and italicized subtextual asides. Moody&#146;s style found its keenest expression in The Ice Storm, his celebrated 1994 novel (later adapted into a film by Ang Lee) that skewered middle-class privilege and shallow hedonism in a 1970s Connecticut suburb. Typical of the author&#146;s wicked irony was a chapter that dissected a cocktail party by utilizing psychobabble terminology culled from the era&#146;s self-help bestsellers. 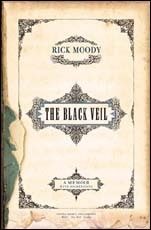 Not surprisingly, Moody&#146;s latest book, The Black Veil, is subtitled &#147;A Memoir with Digressions.&#148; While it marks his first extended foray into autobiographical terrain, the eccentric tone and recondite wordplay will be familiar both to fans and detractors of his earlier work. The central narrative of The Black Veil concerns the fallout from &#147;an unexplained panic event&#148; that came to afflict Moody on Christmas Day some sixteen years ago while visiting his mother. He was a 24-year-old graduate of Brown University, working an unfulfilling job as a manuscript reader for a New York publisher. Moody&#146;s yuletide discombobulation (&#147;There was no trauma, no Hollywood origin for this sensation I had, except things people went through every day&#148;) turns out to be only the tip of the meltdown. Anxieties are soon crowding his thoughts like &#147;truckloads at a landfill.&#148; He is haunted by dark fears of being assaulted and violently raped. Therapy and antidepressants bring no relief. Problems with alcohol escalate. His girlfriend checks herself into a drug rehab facility. Moody winds up in a psychiatric hospital. There&#146;s little that ultimately distinguishes Moody&#146;s experiences from countless trendy memoirs about depression and addiction. One longs for the quiet clarity and eloquence of, say, William Styron&#146;s Darkness Visible. Instead, The Black Veil often deteriorates into a hyperventilating melodrama starring Moody as &#147;the lonely villain in a monster movie, a suzerain of reclusion, drinking, loathing myself…&#148; The promised digressions seem all too arbitrary and lack Moody&#146;s usually sharp thematic cohesion. A four-page analysis of Elton John&#146;s album Goodbye Yellow Brick Road, for example, doesn&#146;t suggest Lester Bangs as much as Patrick Bateman&#146;s intentionally banal rock criticism in Bret Easton Ellis&#146;s American Psycho. A second, more interesting story&#151;told in alternating chapters&#151;is Moody&#146;s genealogical research into an eighteenth century Puritan minister from Maine named Joseph &#147;Handkerchief&#148; Moody. Known primarily as a footnote to American literary history, Handkerchief Moody was cited by Nathaniel Hawthorne as an inspiration of sorts for his classic 1836 short story, &#147;The Minister&#146;s Black Veil.&#148; (Hawthorne&#146;s tale is handily if rather pretentiously included as an appendix to The Black Veil.) Not yet ten years old in 1708, Handkerchief Moody accidentally shot and killed an adolescent playmate. Years later, he took to wearing a handkerchief across his face as a symbol of his guilt and shame. Hawthorne&#146;s fictional Parson Hooper similarly wears a veil, but the short story adds further layers of mystery and metaphor by purposely never revealing the reason behind the minister&#146;s peculiar behavior. The house my father was born in, in Waterville, the ramshackle farm my grandmother&#146;s family had owned in Millbridge, a pestilence of blackflies, steamers on the harbor at low tide, everywhere in these Maine scenes disrepair, enclosures in fog, as if it were a function of Maine that it existed only in memory. Admirably ambitious but fatally unfocused, The Black Veil is best seen as a misstep by a talented writer. Even readers who have enjoyed Moody&#146;s work in the past are advised to get out their handkerchiefs and wave goodbye to this one.